More than forty years ago, Catalytic Generators started out in the US, specializing in the ethylene application for fruit ripening. It has long been the company’s goal to become involved in the ripening of high quality fresh produce in Australia, to offer Australian fresh produce companies a safer and easier alternative to ethylene. “Until recently, Australian ripening companies relied heavily on pressurized ethylene cylinders to provide the ethylene required for ripening,” says Leigh Cummin with Catalytic Generators. Due to the risk of explosion, the cylinders have been identified as a more dangerous form of ripening. As a result, Catalytic Generators saw opportunities to tap into the Australian market. 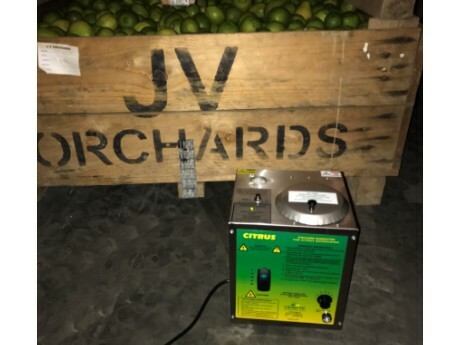 “Back in the day, we developed a process that converts Ethy-Gen II Ripening Concentrate into ethylene when used in combination with our generator. This has been an attractive alternative with ripening companies to remove risk from their business,” mentioned Cummin. “Over the past several years, we serviced Australian customers with our product directly from the US.” Due to increased demand and to better serve Australian customers, Catalytic Generators Australia Pty Ltd. was recently formed. “Our commitment is to provide product and backup service when needed around the country. We see ourselves as partners in the businesses of the ripeners to provide quality fruit to their customers.” The company has set up a distribution warehouse in Melbourne, Victoria. “Given the expertise of the US main office with ethylene for fruit ripening and our experience in the ripening room business, it was a natural fit for us to team up,” shared Cummin. Australian customers who are using the Ethy-Gen II Concentrate are experiencing a higher quality of ripened fruit coming out of their ripening rooms. “We believe this is from the consistent level and quality of ethylene produced by our catalytic generators,” said Cummin. Catalytic Generators has a diversified customer base in Australia. From the small farm in Dimbulah Queensland degreening its citrus crop for the first time, to their colleagues degreening large farms in Gayndah Queensland. “We supply and service large banana ripening centers in the capital cities Brisbane, Sydney and Melbourne as well as mango ripeners in the city wholesale markets. We have been happy to help our customers around the country at all levels,” concluded Cummin. Please visit Catalytic Generators at the Australian Banana Industry Congress in Sydney, June 22-24. Greg Akins with Catalytic Generators USA will also be present to answer any questions. 2017-03-31 "Our goal is for the NZ consumer to be buying even fresher produce"
2017-03-21 Could barcodes be a thing of the past? 2017-03-15 "Thailand has exceeded expectations for kiwifruit and grapes"
2017-03-10 "“We are taking Australasia’s finest fresh produce to the world"
2017-03-07 "AU: "Demand for Cotton Candy and Sweet Sapphire is phenomenal"